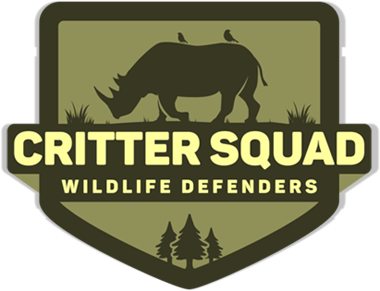 Critter Squad Wildlife Defenders love all of our customers and fans and more importantly we love to hear feedback on how our defender events went. Here is our Defender Event Testimonials page that highlights some great feedback we have gotten from the defenders in our events. "I booked the critter squad about a month ago for my son’s 5th bday party. I originally wanted to go with someone else but they weren’t available the day I wanted so I happen to find the critter squad on the internet. I was a little leery about getting someone who I didn’t know much about but I figured I’d give them a try. I also found a coupon on living social which drastically reduced the price so I ended up adding an extra half hour and having a special guest which was a 15 ft snake. I was pleasantly surprised by their presentation. All the kids sat in their chairs for the whole 1 1/2 hour show and they were extremely entertained. The handlers knew a lot about all the animals and gave a lot of info on them. The kids were able to touch many animals and take cute pictures. I couldn’t believe how many animals they brought. Their show made my son’s bday party unforgettable. I’m so happy I booked them." "Thank you Critter Squad and Kat. I did a party for my 4-year old grandson, he always talked about the Critter Squad when they came to his pre-school. I did the Ultimate Party, there were so many animals, there were bunnies, hamsters, chinchillas, a Guinea Pig and many many more. Kat the lady that came was wonderful, she had a great time with the kids and answered kids and parent questions. She let all the kids touch the animals and even helped with Karen who did not want to go near the animals, she was a fan at the end. You will not be disappointed in hiring the Critter Squad. What a fun time we all had. Thank you Kat! " "Thank you so much for the amazing critter party you brought to us this weekend! Xander loved it so much and talked about it all weekend! I will admit that I was afraid of some of the reptiles at first, but Mr. Jeff made me feel so comfortable that I have a new found appreciation for snakes and lizards. Xander asked if we book again for next year already. Can’t wait! Thanks again!" "My sons birthday party was great thanks to Amanda and all the critters! Thank you … A++!!! " "Hi Critter Squad, We had a great time this weekend. You guys made my daughters party one of a kind. She loved all the animals and our party guests were also very excited after you left. It was amazing! We will tell as many people as possible about The Critter squad." "My daughter takes after school enrichment classes from the Critter Squad. They are an amazing company. She has loved all the teachers she has had at her school and seen so many different animals. They really do a great job. She loved the after school classes so much that we hired them for her birthday party. Courtney arrived at our house on time, and was so very lovely with the children. She was very intelligent and had an answer for ANY question anyone had about the animals. She handled all the children extremely well and did a fantastic job. Handling a bunch of excited children jumping around trying to touch all the animals has got to be extremely frustrating, but you would never have known that from how cool and collected Courtney was. She made my daughters birthday a very positive, memorable experience. They take credit cards, cash, check and sent me an invoice ahead of time. Fantastic company, fantastic employees. 5 Stars. " "I’ve seen the Critter Squad put on multiple shows at birthday parties and misc. events and decided to book them for Reptile Week and my daughter’s preschool. I had numerous conversations with the staff prior to the event. They handle my questions, payment, etc. so professionally and promptly! The party was early morning on the Westside and I was nervous about traffic, but Courtney arrive RIGHT ON TIME! She came in with enthusiasm & such knowledge pertaining to the reptiles! She engaged the kids, kept 3 year olds entertained and in awe for 30 minutes! The show was entertaining and lively. The customer service was impeccable! And overall I give them 5 stars!!" "I wanted to be the first one to write on the new testimonials page. You guys did my sons party on the 8th, and it was FANTASTIC. My son has not stopped talking about all the amazing animals. He especially loved BIG MOMMA! Thank you again"
"Critter Squad was amazing, I hired them to do an animal show for my son’s birthday party. The show was very entertaining and very educational for the kids. The staff was extremely friendly and patient with all the kids. I would highly recommend Critter Squad!" "Charlie was so excited to see all those animals that he didn’t stop talking about them all day. Thank you for a great experience, the animals were amazing." "I run a day care in the South Bay. We have used Critter Squad twice for camp day presentations and I have zero complaints. I love what they do and the animals that they bring to show the children. The presentation has always been educational, exciting, and most of all safe for the animals and children. I am also pleased with the pricing of the Critter Squad Presentations. I love animals and I definitely have not witnessed or noticed any maltreatment during presentations. " "The Critter Squad did a great job for our granddaughter’s 5th birthday. Kept a group of kids, ages 20 months to 6, entertained for over an hour." "Your participation in our annual Nature Fair was awesome! The Critter Squad was a hit! We would love to have you back again next year. Everyone will be looking forward to it, especially my son Evan." "I saw the Critter Squad at a carnival event and the staff and animals were awesome!" "We just had our daughter’s 10th birthday party and and it was a huge hit! Miss Kat was amazing, fun, professional and so knowledgeable. The kids were fascinated and attentive the entire time. Miss Kat came exactly on time, set up and cleaned up without a trace too. It was so much fun! I would recommend Critter Squad to everyone and would definitely use them again! (PS- The hedgehog was a blast!)" "When that huge snake came out of the sack my wife almost passed out, but I thought it was pretty cool. My daughter and her friends had a great time and they loved the different animals. Thanks again, keep it up." "What a great concept. Introducing these animals to young children and educating the kids on safeguarding the critters in a fun and small environment is awesome. Kudos." "My daughter and I attended a birthday party in January and I must say it was the best critter party she has been to. (This was her 3rd one). She enjoyed it so much that she now wants them to come to her next party! Thanks so much for the great show and “touch”!" "My nephews decided to visit me in California so I decided to throw him an early birthday party (they’re 3 and 1 1/2). Since my nephews really likes the zoo, I’ve decided that a hands-on experience will be great for them. When I first called the Critter’s squad to inquire about their service, they were very informative about their service, animal care, safety and pricing. I opted for the 30 minutes 4 animal package for $85 because it seems to be the best package for the two of them. They were really good with the children and gave everyone (even the adults) a great and wonderful time. They arrived promptly and gave the children the opportunity to pet and learn about the animals. Even though my nephew was terrified at first, they were patience with him and showed him how to pet and hold a snake (he only had one hand lifting the snake). My nephews’ overall favorite animal of the night was the goat. Overall, I thought it was very educational (especially for the adults), and fun." "I purchased a voucher for an “Ultimate Critter Party” off of Living Social for my son’s 5th birthday party. It was phenomenal. I was worried about the animal trainer being able to hold the children’s attention, but my worries were for nothing. Not only did she hold their attention, (which was difficult, since there was an 18 foot slide jumper right next to her, that I pulled them off of for the critter party), she held the attention of the adults as well. She was informative, answered all questions, silly or other wise and totally knew her stuff. She was strategic in how she brought the animals out too, to make sure and keep the kids interested. I just can’t say enough. I believe our trainer’s name was Amanda, she was just a delite, and so awesome with the kids. I would totally recommend this company and actually had parents raving about what a great experience it was for the kids. By far, the best deal I’ve gotten from Living Social! Thank you Critter Squad!" "It was my grandkid s birthday and we had an animal show provided by The Critter Squad. I have to tell you that I personally not a big fan of snakes. But this show changed completely my view on snakes and iguanas. First of all, Geoff Mantonya was so enthusiastic and knowledgeable that everybody (around 20 kids and 40 adults) were listening with open mouths. He brought a lot of different animals and let us all pet that animals. Kids liked it so much and I mean all kids. But honestly I m not sure who enjoyed it even more, kids or adults. I have to tell everybody that it was absolutely great experience. Thank you Geoff very much. I’m planning to do this again. "